Former coal strip mines in Virginia now are the sites of shopping centers, golf courses, airports, prisons and even a winery. 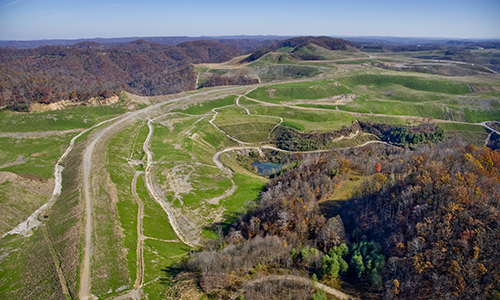 Now there’s a push to draw a different kind of energy from old strip mines — solar energy. Virginia’s coal production peaked in 1990 at more than 46 million tons. In 2015, production fell to a little more than 13 million tons. Meanwhile, production per miner increased dramatically, so the need for mine employees dwindled. In May, mining provided just 416 of Wise County’s 11,443 jobs. The county could use an economic boost. Its median household income, $37,407, is less than 58 percent of the state median of about $65,000. Wise County’s April unemployment rate, 6.8 percent, also was three percentage points higher than Virginia’s rate of 3.6 percent, and its poverty rate, 22.7 percent of its population, was more than double the state average of 11.2 percent. The county’s population, estimated at about 39,000 last year, has fallen more than 5 percent since 2010. Wise is a long way from Richmond — six other state capitals are closer — but Kennedy argues that’s no reason to disconnect Southwest Virginia from the Digital Dominion. “Just because we’re out here doesn’t mean we can’t engage in these modern technologies,” he says. Indeed, Wise already is home to data centers, and Kennedy sees “a groundswell of grassroots support” for renewable energy, which might attract more data centers. Energix Renewable Energies, an Israeli company, is exploring possibilities in Wise. The advocacy group Appalachian Voices has determined more than 400 acres of former mines near Lonesome Pine Airport (which sits on a former mine site) are suitable for solar energy development. Wise County is cataloging appropriate sites. Kennedy is convinced renewables — solar on old strip mines, wind on ridge tops, hydroelectric from water in abandoned underground mines — can make Wise County a 21st-century energy producer.